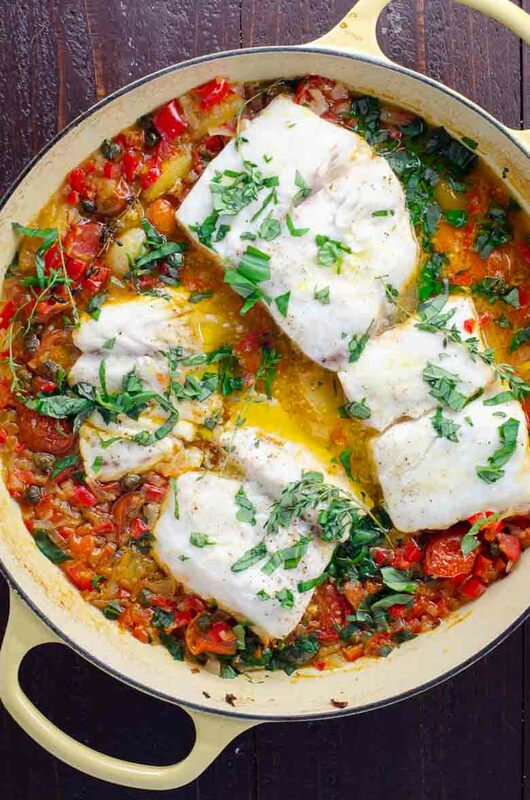 This easy striped bass recipe comes together in one pan with very little work. 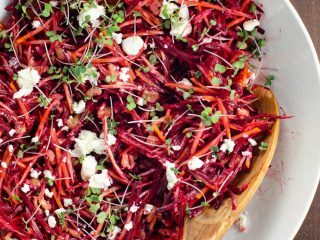 It's simple enough for a weeknight dinner but looks so beautiful, bursting with rainbows, that it's great for company, too. If you don't have striped bass, substitute Atlantic cod, black sea bass or halibut. You guys. Umami Girl turns 10 YEARS OLD tomorrow. There will be cake. And three cheers, at least. And — with any luck — a nap. But first, this. Our new favorite striped bass recipe. It's special and super-delicious but totally fuss-free. And maybe best of all, it reminds me of Umami Girl's early days and raison d'être.I created this recipe in honor of some perfect fresh striped bass caught locally by our friend Jac, and now I'm hoping more of our friends will cook Jac's fish this way, too. That's not such a far cry from our earliest recipes, created to help members of the Catalpa Ridge Farm CSA use the fruits and veggies they'd picked up from our Hoboken, NJ garage that week. Yay for all that. I can't quite decide whether it feels like ages ago or yesterday. We love the way this recipe comes together quickly and easily without any fancy techniques, but still yields a pretty impressive result (not to mention an open bottle of wine). 🙂 The only real work is in chopping the shallots, bell pepper and tomatoes nice and small so that they cook down into a beautiful sauce in a relatively short time. 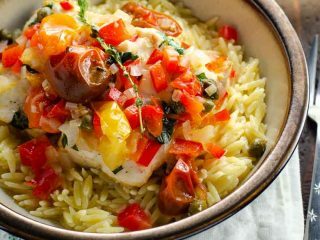 Other than that, you get to just nestle everything into a pan and let it work for you while you do your thing.There will be plenty of delicious, saucy broth at the bottom of the pan, so we recommend serving the fish in wide, shallow bowls on top of our favorite easy orzo to soak it all up. And if you're not awash in striped bass but are still looking for a great baked white fish recipe, feel free substitute cod, black sea bass or halibut. We love this recipe for its great combination of simplicity and flavor. Make it in one pan in the oven with no fussy techniques of any kind. The result is brightly colored and full of complementary flavors that really let the fish shine. There will be plenty of delicious, saucy broth at the bottom of the pan, so we recommend serving on top of our favorite easy orzo to soak it all up. If you don't have striped bass, substitute cod, black sea bass or halibut. Preheat oven to 400°F with a rack in the center. Into a large, heavy pan with a lid (such as this one or this one), place the shallots, bell pepper, tomatoes, garlic, capers, wine, stock, thyme and 1/2 teaspoon of the salt. Bake, covered, for 20 minutes. Pat sea bass fillets dry with paper towels. Carefully remove pan from oven and arrange filets in pan on top of sauce, nestling them in a bit. Sprinkle fish with remaining 1/2 teaspoon salt and dot with butter. Return pan to oven, uncovered. Bake until fish is just cooked through, about 15 to 20 minutes depending on thickness. To serve, place about a cup of orzo into each of four wide, shallow bowls and top each with a piece of fish. Spoon some veggies and plenty of sauce overtop, and sprinkle with basil and freshly ground black pepper. Choose a wine that you like to drink. I used Kim Crawford Sauvignon Blanc from New Zealand, which is one of our longtime favorite value wines. It's widely available.